Actor and director George Clooney and screenwriter Grant Heslov, the team behind The Men Who Stare at Goats and Good Night and Good Luck, team up for an old-fashioned historical war film about a middle aged group of men who set out during the latter years of World War II to recover most of the stolen art works secretly stashed in Nazi hordes across France, Belgium and parts of Germany from 1943 to 1945 as the Germans retreated in defeat as the tide of war turned against them. 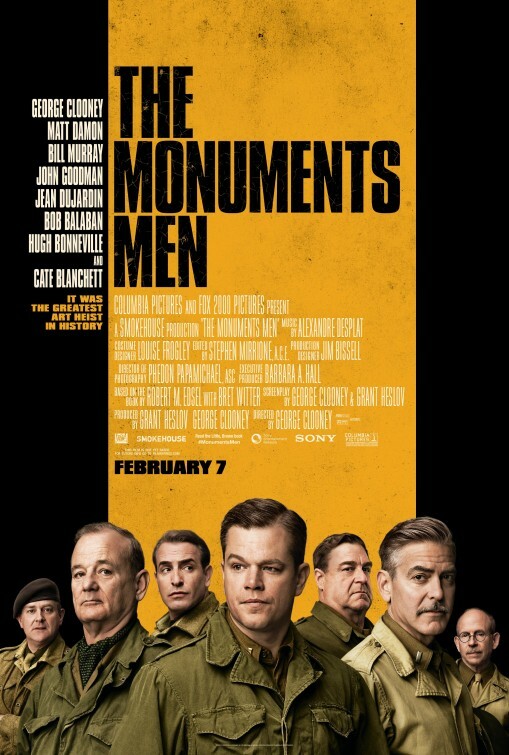 Whilst The Monuments Men boasts an all star cast including Bill Murray, Jean Dujardin (from The Artist), John Goodman and Matt Damon, the film doesn’t quite match up to the incisive political comment of the Oscar winning Good Night and Good Luck about the approaching threat of McCarthyism on broadcast journalists in the 1950’s. Instead, Heslov and Clooney focus more on the after effects of war and looting and the utter destruction of entire communities, mainly the European Jews at the hands of the ruthless Nazi’s during the holocaust. There are moments of humour interjected in a mainly historical narrative about how these men travelled across the European Theatres of War from Paris to Brugge to Normandy to track down the hugely valuable and culturally significant pieces of art works stolen by the Nazi’s from Rembrandts to Michelangelo’s famed sculpture Madonna and child stolen from a Belgium monastery. There is a brief interlude with Damon as Captain James Granger teaming up with a French Resistance woman in Paris forced to work for the Nazi’s Claire Simone played by Cate Blanchett, with an indistinguishable European accent. There is the witty banter between Richard Campbell and Preston Savitz played respectively by Bill Murray and Bob Balaban and then there is a wonderful cameo by Hugh Bonneville (Downton Abbey) as Donald Jeffries a British Lieutenant who sobers up to join the Monuments Men to save his famed Madonna. Whilst at times The Monuments Men comes across as sentimental and nostalgic, it’s because its focusing more on the saving of priceless art than on the horrors of conflict and the utter destruction of parts of Europe. This film is in no league to such Oscar winners as Saving Private Ryan or Anthony Minghella’s elegant The English Patient. Instead The Monuments Men shines light on the aspect of war which is often neglected the looting of treasures by the conqueror over the defeated and the crazy scheme of Hitler’s 3rd Reich to build a Fuhrer Art Museum in Berlin, which naturally never materialized. If anyone has been to the great art museums of London, Amsterdam, Paris or New York, many viewers will know that much of the greatest artworks was saved and restored to their original glory. For art historians, The Monuments Men is a delightful and fascinating film, but for lovers of War films, don’t expect loads of action or bloodshed, just lots of barbed humour and the occasional tragic scene as this band of merry men navigate through dangerous battlefields to reclaim the original treasures of war. Recommended for lovers of nostalgic war films.